What is Security Risk Management? Security risk management (SRM) refers to a practical process wherein the most complex issues and challenges that continue to surround security are assessed and identified with an aim of establishing effective, focused and comprehensive mitigation measures. The whole process is mainly based on the most modern and advanced practices for security risk management and are capable of producing a more solid rationale designed for all the essential expenditures associated to physical security measures, services, equipment and any other requirements that are fully related to security. Achieving the highest level of security is extremely useful for all business organizations so it is no longer surprising why many people find the effective and successful implementation of the security risk management process beneficial. This process aims to identify all the threats, risks and vulnerabilities that have the tendency of negatively affecting the operations of a business organization. It aims to reduce all these threats, vulnerabilities and risks to achieve better performance. The security risk management process does not work by seeking to inhibit present practices while also using other security management tools offered by decisions makers and focal points. It works by creating a more standardized and logical way to make sure that all forms of risks and threats are immediately identified and certain measures are instantly incorporated into business operations and planning to prevent and reduce them. Because of the effectiveness of the security risk management process in improving the performance of your business, you have to make sure that you allow it to form part of your security management department. It is highly recommended for you to take part in the security risk management certification program offered by Brainmeasures if you are one of those who have longed to gain a more complete understanding about how to carry out the whole security risk management process. The security risk management course which you can now access at Brainmeasures gives you the opportunity to understand the most effective strategies that you can use when it comes to improving the level of security when operating your business as well as the most essential principles and procedures that you need to follow when starting to implement the process. With the help of this certification course, you also get the chance to access a kind of security risk management training which does not only improve your knowledge about the SRM process but also offers a stronger and more efficient guideline in the field of preparing and using security risk assessment which is a major help in making the most out of SRM. Holding your certificate in this field is a huge help in showing the entire industry that you are capable of providing effective solutions for security risk management. How to effectively apply risk management as a means of securing essential business information? The security risk management certification program is capable of benefiting hundreds of individuals and professionals in the industry because of its proven comprehensiveness. This certification course is more beneficial for financial managers, data and IT managers, risk professionals and any other professionals who are responsible in maintaining the highest level of information and data security for different types of business organizations and in effectively developing plans for security risk management. Enrolling in a security risk management certification course and successfully completing it is a huge help when it comes to increasing the amount of salary that you regularly receive. You can actually use your security risk management certification to work as a chief information security officer which offers an annual salary of $44,000 to $70,000. 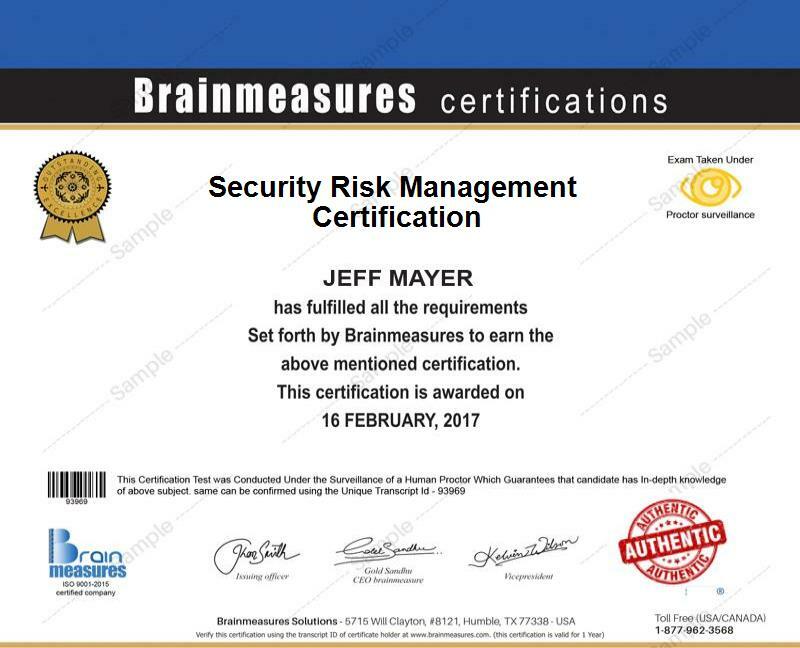 You can also use the certificate that you receive from Brainmeasures to become an effective security risk manager. You can expect this to help you receive around $86,000 to $106,000 per year. You can also get the position of a chief information security officer which is a huge help in earning as much as $215,000 annually.